I realised today that it's the last day of August and I hadn't posted anything all this month, partly because there has been too much design work for our publishing house, Permanent Black. Also, unusually for me, I actually did one reading this month and am getting ready for another next month. The first was at SAP, in Delhi. SAP is a giant international software company and believe it or not, one of the perks it offers its employees is a book club. I've never heard of something like this. Perks to employees are usually fancy luggage and smartphones at the end of each year or anything else that can be clearly and easily quantified. But books? Anyway, they have this book club, to which they bring authors to speak, read, meet. I was quite intimidated at the thought of a roomful of bright young computer engineers, but they turned out to be sympathetic and attentive, plus sure of what they demanded of a book (a gripping story, characters they could empathise with, a sense that the book would shut out the world) and full of curiosity about writing and publishing. 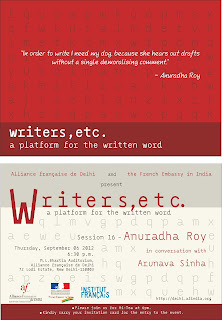 The next event will be an interesting one because I am doing it with the translator Arunava Sinha. Arunava has translated (last counted) 14 Bengali books into English, among which is Chowringhee, which was shortlisted for UK's Independent Foreign Fiction Award, a hugely prestigious prize. 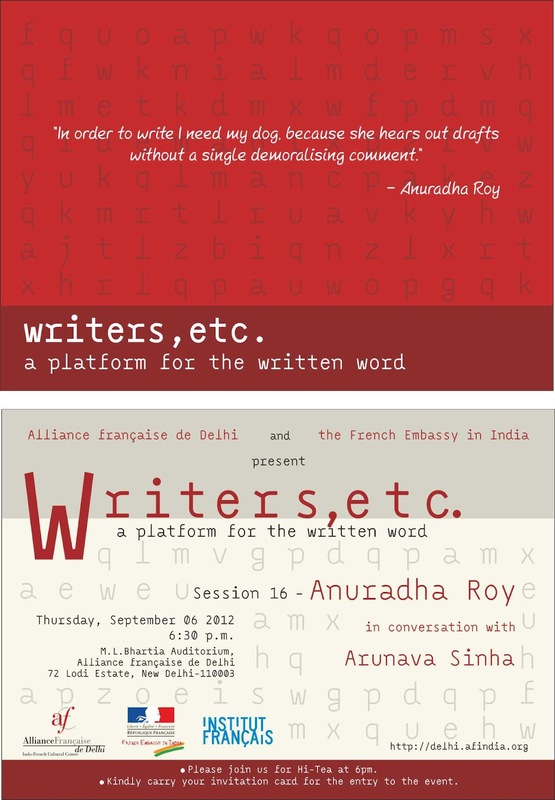 Arunava and I will talk about our work with each other and with the audience and there will be a brief reading from An Atlas of Impossible Longing in French and then in English. It'll be informal and anecdotal. This event is organised by the French Embassy and the Alliance Francaise and the details are in this card. It is open to all.